Smart phones, iPads, digital cameras, allow us to photograph indiscriminately, leading us to amass hundreds if not thousands of images. How many of these escape the memory card and find their way to the old-fashioned album? How many of us spend lost hours flicking through page after page of nostalgia, family members and friends long gone, some forever nameless and forgotten? This digital world is creating a host of problems for archivists. How do they access the intangible? How do they record the virtual? It’s a problem. Once upon a time they could rely on most households having of an old biscuit tin tucked away at the back of a cupboard bursting with creased black and white family photos, or a crumpled album, tissue paper awry, a family’s lineage in monochrome, stretching back into the distant pass. This was a family’s history in picture form; you could see it, feel it, smell it even. But that’s all gone with the digital image, hasn’t it? Derek Evans prodigious output, and its supreme organisation, is a gift not just to archivists, but to us ‘ordinary folk’. Of every photo he took, and they were in their hundreds of thousands (all taken on a roll of film), we have concrete evidence of an event, an individual, an occasion, from the sublime to the ridiculous. In essence, we have a living, breathing visual record of Herefordshire’s social history. It is invaluable. And it is part of the local archive, being cared for and curated at HARC (Hereford Archives and Records Centre) in Rotherwas and accessible to all of us. We should never forget that Derek was running a business and as any self-respecting photojournalist/journalist will tell you, any photo that makes it into print, is recorded in a ‘cuttings files’. It’s possible these have also been destined to the dustbin, a crying shame. Derek’s studio ‘cuttings files’ are a veritable gem. Do not be fooled by these scruffy, well-thumbed, torn in places, old scrapbooks. Open the covers and you walk into ‘Herefordshire’, chapter and verse, in all its technicolour, eccentricity, and sheer beauty and majesty of landscape and people; a gorgeous visual chronicle of Herefordshire life. Within their non-descript, thread-bare covers, these cuttings reveal a panoply of life, stories – or people - that no-longer make it into newspapers. Today they might be picked up by YouTube or other social media. Dip into them and you read about the Eardisland pet badger, the young football player using pigeon mail, the film starlet fishing on the Wye, minnow hunting in the river. We have recycled some of these stories on the project Facebook pages and have been stunned and heartened at the response. The pet badger photograph is a case in point. The sisters in the photo were delighted to see the image after all this time and the comments provided background to the story we were never privy to. We even learned that the badger went to the pub and lived under their house! Another photo we recycled on Facebook was that of a Boer War veteran celebrating his centenary in the early 1950s. Astonishingly, even this, some 70 years after it was taken by Derek, prompted comments from distant relatives. 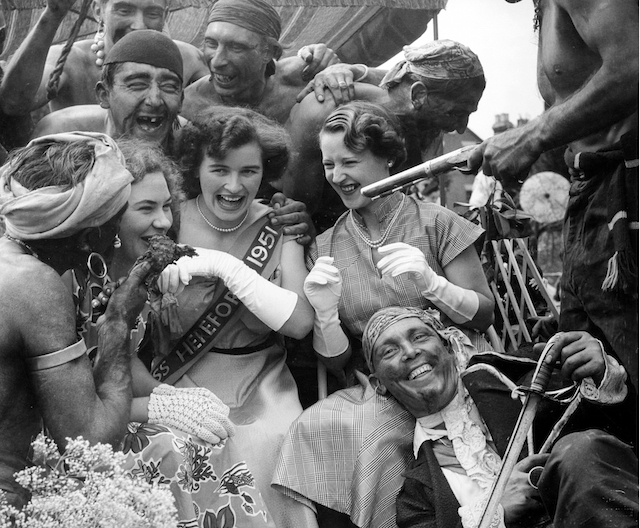 One image plucked from the archive that the project has used in its promotions is of a town carnival queen. It’s such an evocative picture from another age. One so often wonders when posting these photographs, what on earth happened to these people, how did their lives pan out? 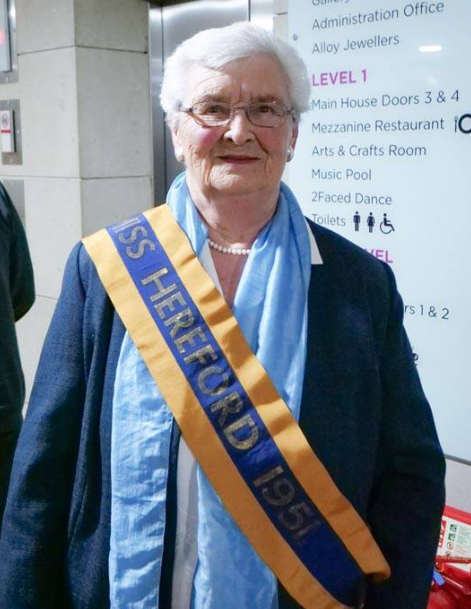 Thanks to social media – again - it can be a force for good – we quickly learned that this young girl in her sash of office is Jean Griffin, who is alive and well and still living in the city and later in life wore another ‘sash’ of office, that as consort to a former Mayor of Hereford. Her family were delighted to see her face pop up and be reminded of the young women they never knew. Sometimes we are lucky, as in the previous examples, and find out more about the people involved. Others remain a mystery and might always remain so. Nonetheless, we really do feel at times that we are reaching back into the past and making tangible connections to the present. And that is a good feeling.